As Christmas and the holidays approach, many begin to feel a sense of joy and excitement as they prepare for the festive season. For others who experience social isolation, the holidays highlight feelings of loneliness and anxiety. A 2016 Lifeline survey found that 60 per cent of respondents “often” felt lonely. The organisation also revealed that 55 per cent of callers to its crisis line lived alone, “often without strong support networks”. Older people in particular are susceptible to social isolation. Research shows that risk increases with age as people experience significant and ongoing life changes like retirement, bereavement, divorce, illness and relocation to aged care. With this in mind, non-profit organisation Villa Maria Catholic Homes (VMCH) is encouraging community members to #reachout and do their bit to help make a positive impact. VMCH Pastoral Care Services Senior Manager Mary McInerney estimates about a third of VMCH affordable housing residents and 20 per cent of aged care residents are alone over the Christmas period. Mary said some affordable housing sites put on a pre-Christmas gathering for residents and neighbours kept an eye out for each other over the holidays. 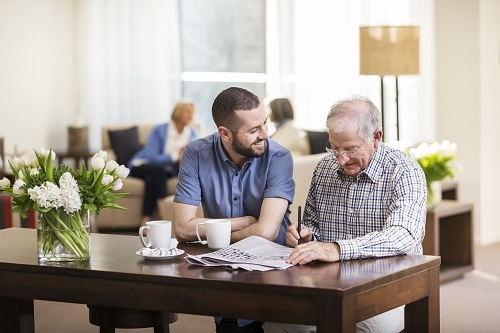 In VMCH aged care residences, more than 350 volunteers play an important part in connecting with older people through social visits. So what can the community do to help? ‘Ageing is everyone’s business – a report on social isolation and loneliness among senior Victorians’, says: “social contact is an important protective factor against social isolation and loneliness”. While some people choose to be alone and enjoy solitude, there are others who struggle with social connection and therefore are alone, not by choice. Simple gestures like checking in on a neighbour, saying hello to people in the street, visiting an older relative or friend, taking a Christmas meal to someone in need, or volunteer to visit someone in aged care. fortunate in the process,” Mary said. VMCH is a Victorian based Catholic not-for-profit organisation.